Agriculture, which is also known as primary sector of economy, is however not a primary contributor to the economy in terms of GDP. Despite the fact that agriculture contributes to roughly around 15 per cent of GDP, it provides subsistence to more than 50 per cent of the workforce. It means that in order to improve the income of the majority of workforce which is engaged in agriculture, a two-pronged strategy is required where on one hand, government would promote activities whichincrease the agriculture productivity and on the other hand, manufacturing and tertiary sector of the country had to be made more employment intensive. The green revolution in 1960s and 70’s had enormously increased the agriculture productivity in India but since the last decade, the agriculture productivity has almost plateaued and country is in dire need of a second green revolution. The first green revolution had a very limited geographical reach which was confined to Punjab, Haryana and western Uttar Pradesh as these regions were well irrigated with the dense network of canals. Even after 75 years of independence, Indian agriculture still depends upon the vagaries of monsoon. Also, the geographical distribution of monsoon across India is not uniform due to which every year, large parts of the country suffer drought while the rest remain submerged under the flood water for most part of the monsoon season. The interlinking of rivers project is to transfer the water from water surplus rivers to the rivers with deficit water. Every year large parts of Eastern Uttar Pradesh, Bihar and Assam remains flooded due to the flooding of Ghaghara, Gandak, Rapti, Kosi and Brahmaputra rivers while the states in the south like Karnataka, Tamil Nadu keep fighting for their share of water in southern rivers. 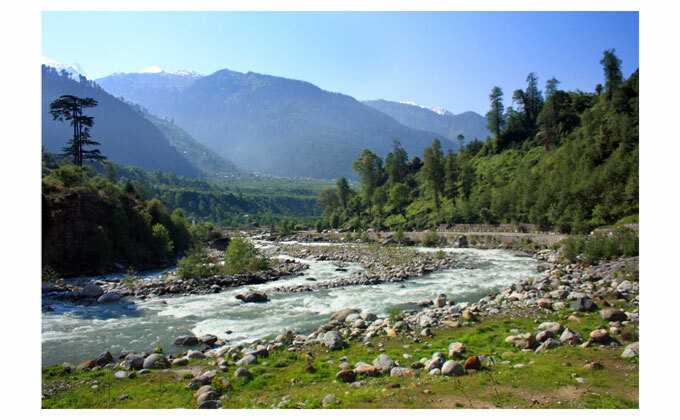 Though the murmurs for interlinking of rivers is doing round in the government circles since pre-Independence period, in the year 2005, the project received some real fillip asNational Water Development Agency (NWDA) was entrusted with the task and the project got a serious start. The project will have three components - Himalayan Rivers Interlink Component, Peninsular Rivers Interlink Component and Intrastate Rivers Linking Component. NWDA has studied and prepared reports on 14 inter-link projects for Himalayan component, 16 inter-link projects for peninsular component and 37 intrastate river linking projects. December 2015 would mark a humble beginning for the ambitious Interlinking of Rivers Project when the work on interlinking of Ken-Betwa (Number 24 in the map) would start. 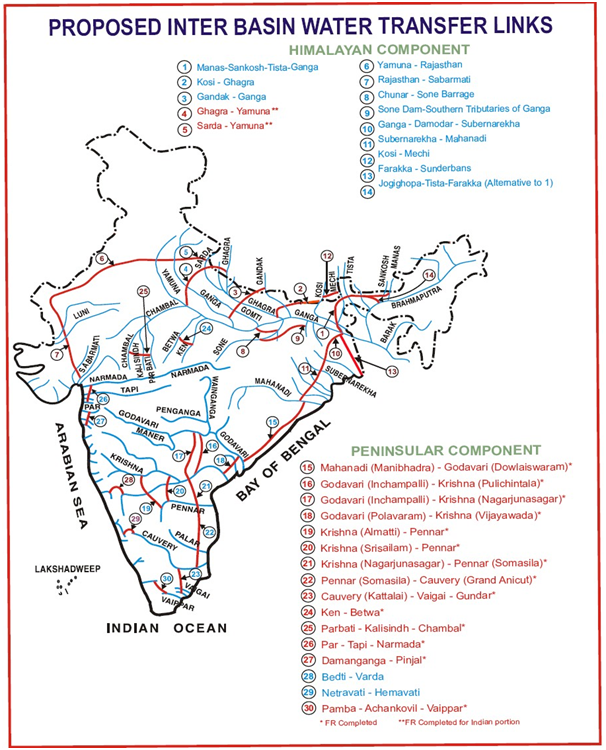 The linking of Ken and Betwa rivers would provide irrigation facility to water-deficient Raisen, Vidisha, Tikamgarh and Chhatarpur districts of Madhya Pradesh and Hamirpur and Jhansi districts of Uttar Pradesh.A dam is proposed on river Ken at Daudhan which would also produce 72MW of electricity. The total length of the link canal from Ken at Daudhan to its outfall point is 231.45 km including a 2 km long tunnel in its head reaches.The canal will join an existing reservoir namely Barwa Sagar from where the diverted water will join Betwa river through a natural stream. Net benefits from the link project would likely get a boost when it becomes regional development project that integrate irrigation, power generation and municipal water supply with catchment area management, conservation, tourism, fisheries and rural development. According to the Director General of NWDA, Construction on the Damanganga-Pinjal and Par-Tapi-Narmada links in Gujarat and Maharashtra and the second phase of the Ken-Betwa link could also start very soon as their detailed project reports already completed.Many environmentalists and social NGOs have raised objections over the project that it would cause large scale displacement of people, deforestation and would ultimately increase the process of climate change which would again severely affect the poor who belong to the most vulnerable sections of the society. Another factor going against the project is its exorbitant cost. Ten years ago, the estimated cost of the project was around INR5.6 lakhs crores which is expected to have further increased by now. Social activists call for projects which are less expensive and don’t call for large scale displacements like water harvesting and watershed management etc. It is true that large scale displacement is a stark reality of such kinds of large scale project and adequate compensation must be provided to the displaced who are generally poor and tribal who don’t know about the alternate sources of living.But the benefits accruing from this project are also immense. If all the project affected families (PAFs) are adequately compensated, a proper cost-benefit analysis will definitely rule in favour of the project. Once the interlinking project is completed, it is expected to generate 34,000 megawatts of power and raise the ultimate irrigation potential from current 140 million hectares to 175 million hectares. On environment front too, the increased utilization of surface water would decrease the dependence of underground water and would put a stop on its depletion. Many analysts argue on the basis of ‘agriculture versus industry’ where they construe that if the government is doing something in favour of industries, it is anti- farmer and vice versa. But the fact of the matter is that both agriculture and industry are complementary to each other. If agricultural income is increased, the income of around 50% of the population increased which creates additional demand for the industry. Similarly many industries also use various agriculture products as their raw materials which create additional demand for the agriculture. Thus any policy for the development of either agriculture or industry should be seen as the policy overall economic development of the nation. As far as interlinking project is concerned, it would help both agriculture and industry as it would not only increase the irrigation potential of the country but would also generate 34000MW of electricity which is vital for the development of both industry and agriculture. Not only, this, the project has something in its bag for environmentalists and NGOs too as it would assist in putting a brake on rapid underground water depletion along with supplying clean potable drinking water to the local population.